I hope everyone had an enjoyable Labor day weekend. I wanted to share my petite rose dishes again before I put them away for the summer. I also wanted to try some chai tea, I'm basically a coffee drinker, but with fall approaching I'm always looking for other hot beverages to try. If you're not familiar with chai tea, here's a little background on it. Chai tea is a flavored tea beverage made by brewing black tea with a mixture of aromatic Indian spices and herbs. Originating in India, the beverage has gained worldwide popularity, becoming a feature in many coffee and tea houses. It is traditionally simmered with green cardamom pods, (aromatic seeds of a plant in the ginger family) cinnamon sticks, ground cloves, ground ginger and black peppercorn mixed with black tea. Milk and sweetener are also added. Retail versions include tea bags for infusion, instant powdered mixtures and concentrates. I've never cared for traditional hot tea with sweetener, I love it iced, but with the addition of milk and other spices I wanted to make my own version of chai. 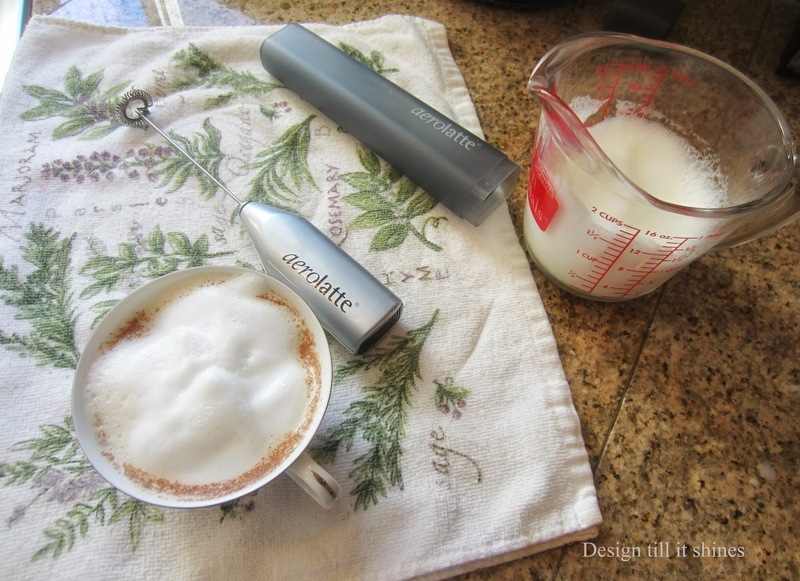 I bought a milk frother recently for my cafe lattes, so I decided to use it to make a chai tea latte as well. Here is a basic recipe I found for two to four servings. 1. Boil water and put in both tea bags. Let steep for one minute and toss bags. 2. Add ginger, cardamom, and clove and stir in. 3. Heat sugar and milk together separately until sugar has dissolved, and pour half a cup into each mug. 4. Remove clove from tea, stir in cinnamon, and pour half a cup into each mug of milk mixture. If you have an espresso machine you can add steamed or foamy milk on top instead of mixing it with the sugar in step 3. Just add the sugar into the tea mixture after step two instead. Add a light dusting of cinnamon or nutmeg on top and enjoy! I changed the recipe a bit because I didn't have any cloves or cardamom. I added cinnamon and ginger to my simmered tea. I didn't take any pictures of the steps, but I wanted to share the frothing process. Since I am experimenting with the flavors, I only used 1 cup of milk with the sugar and added a little vanilla flavoring. I heated it for about 90 seconds in the microwave and frothed the milk with my aerolatte. 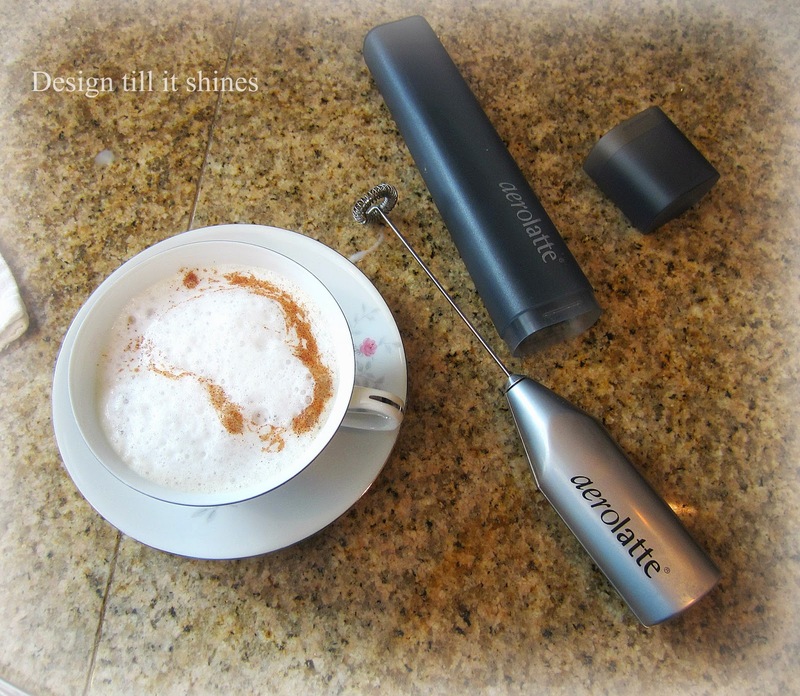 This isn't a recommendation for the aerolatte, it just happens to be the one I bought recently at Bed Bath & Beyond. It does froth the milk really well, I had foamy milk in less than 30 seconds, but the switch that turns it on is rather hard to move at times. It is also battery operated and sometimes it doesn't seem that powerful, but so far it froths great as you can see. It also has a nice holder for storage. The frother adds a pretty foamy top and I sprinkled on some cinnamon. 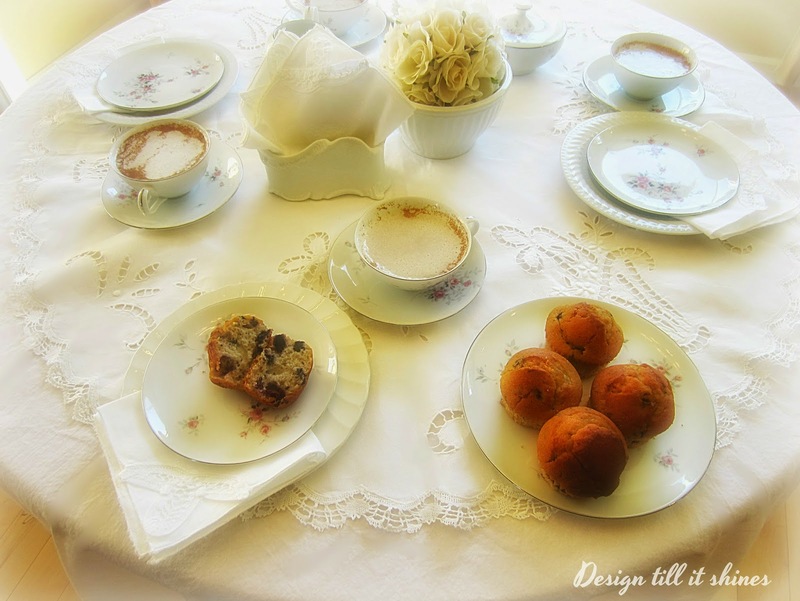 I made some blueberry muffins from a mix, I added fresh blueberries though, and created a simple teatime tablescape. A closer look at my sugar bowl. 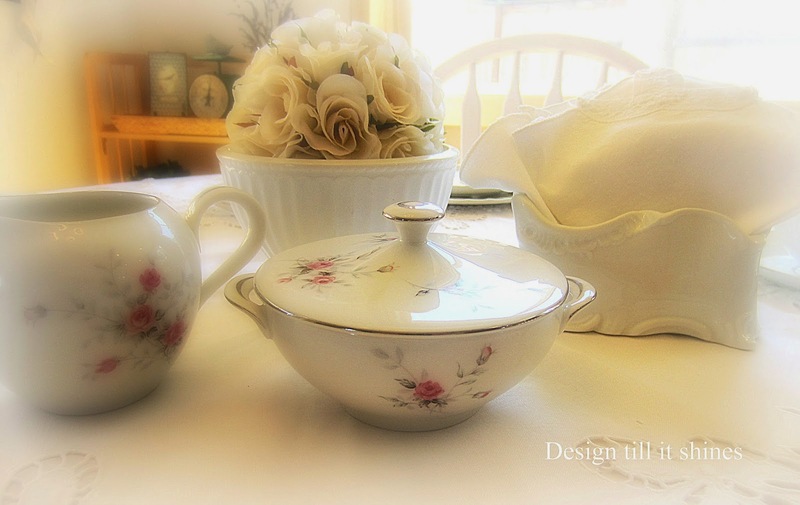 I love the soft rose pattern on this china. The thrift store where I bought my dishes had the entire set, but I bought them at different times since I didn't know how I was going to use them. I also have other china in storage so I decided not to purchase the dinner plates or bowls. I didn't buy the sugar bowl on my first visit so I went back and fortunately it was still there. I also found this pretty white ceramic holder that I used for my extra napkins. To see an earlier post of this china with my canning jar rack visit here. 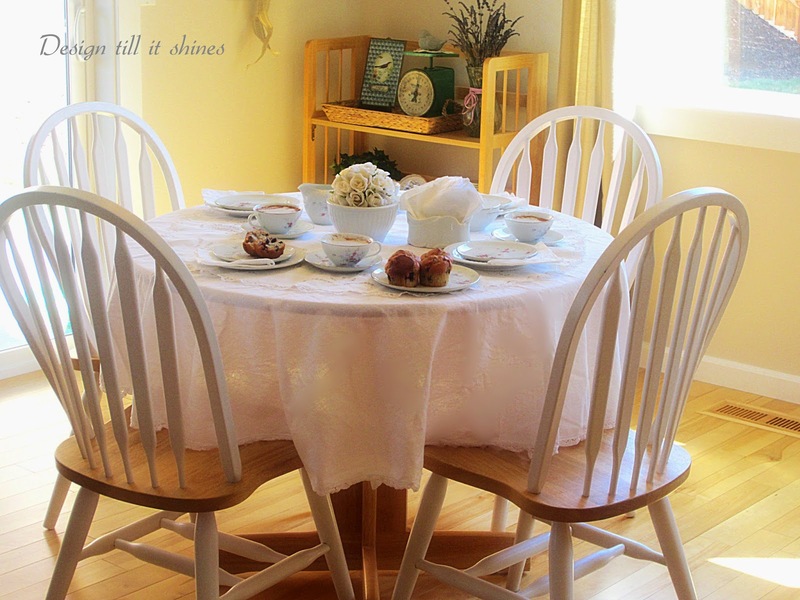 A simple white table setting always brightens up a room. My version of chai tea came out fairly well. It needed more spices, but it was a decent cup of tea. I did love all the milk and frothy foam, so I will try again with other flavorings. There are many ways to prepare chai, so experiment and find the kind you like best. I thought I might try some with a hint of orange and cloves, also pumpkin spiced tea and cafe lattes with spices sound really good for fall. Thanks for stopping by! 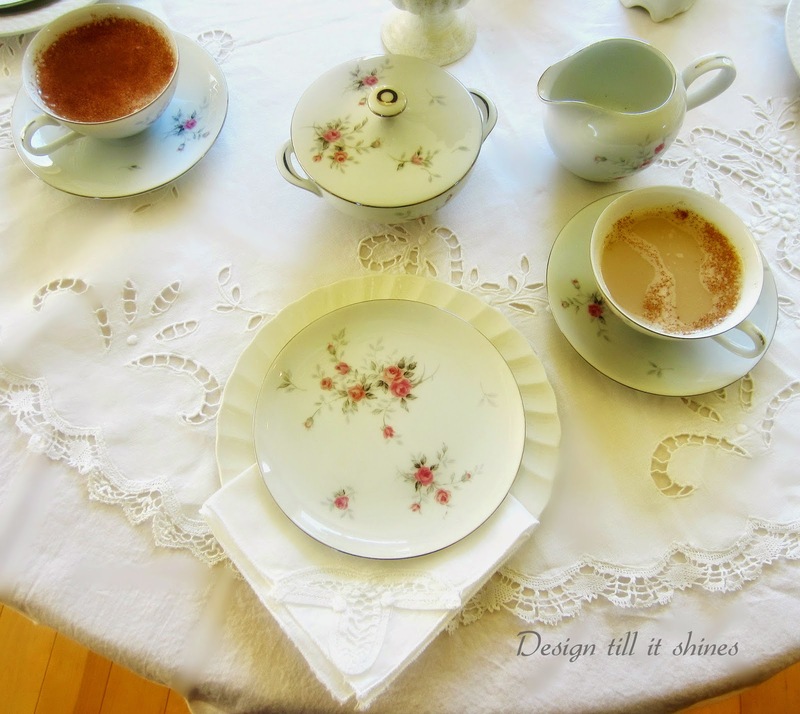 Thank you for this most pretty tea party! I've not tried chai tea, but it resembles many of the Cretan concoctions here that are hundreds of years old! 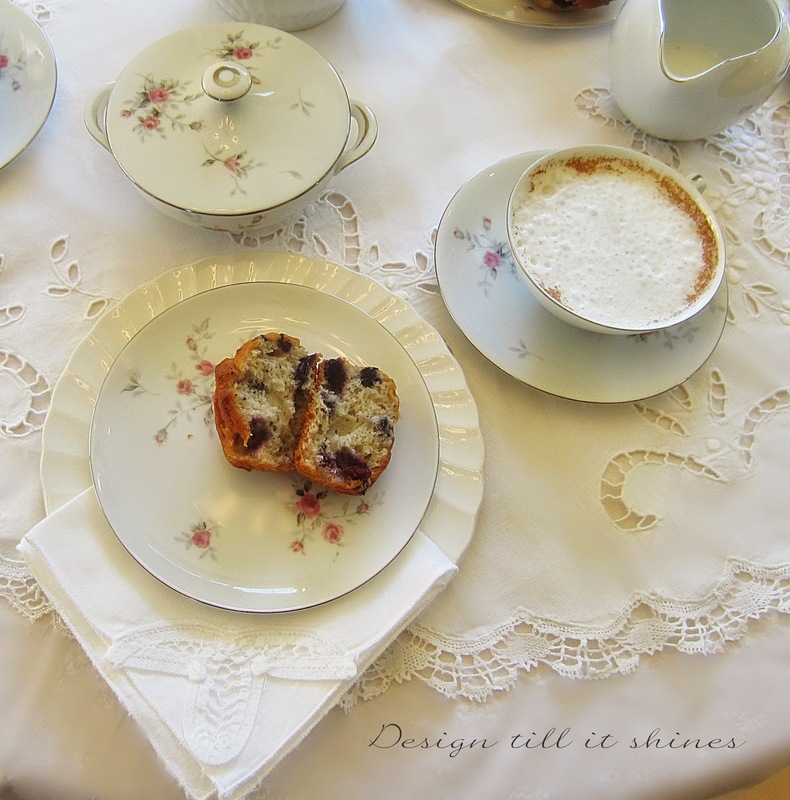 Blueberry muffins are my favourite, and yours look scrumptious alongside the dainty porcelain teacups! Everything looks delicious including your pretty china. Love the table setting. Thanks so much for sharing at Vintage Inspiration Party. Makes a tea party sound like fun. Chai is good isn't it? I just ordered some pumpkin spice tea, can't wait to try it! I love, love, love chai tea---I like the one Twinnings makes soooooo much. I like their decaf version as well. It makes me so content and believe me I am a coffee drinker! I do drink black strong coffee and many cups during the day. But in the afternoons and evenings I often like chai tea, but I just like it without the milk and sugar......I like it the regular way too, as you describe, but I do not need the extra calories. I just like the full flavor of the Twinnings chai---yup! Ps--the tablescape you designed is wonderful--love the lacy topper. I always enjoy reading your comments! Welcome to Design till it Shines. We live in the lovely scenic Pacific Northwest. I needed a creative outlet and after finding so much inspiration on the blogs I thought it was time I joined the blogging community.I prefer french farmhouse decor but so far I have an eclectic mix of styles. I am interested in paper crafts as well as thrifty finds that I can turn into a style that best defines me. I hope you'll join me when you can. Copyright 2012-2015 Design till it Shines. Simple theme. Powered by Blogger.